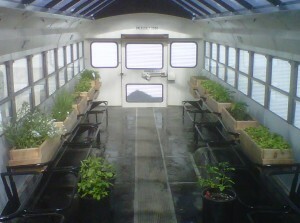 The Bozone Ozone Bus (BOB) is a fully functional “greenhouse on wheels,” made from a converted school bus. 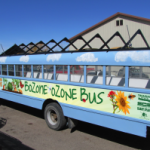 The Bozone Ozone Bus (BOB) is fully operational thanks to the efforts and inspiration of Bozeman’s youth via the Bozeman Youth Initiative (BYI). 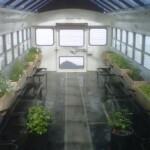 BOB is a fully functional “greenhouse on wheels,” made from a converted school bus, an idea that grew out of a conversation between BYI director, Greg Owens, and a local student. The bio diesel fueled bus is on a mission to educate youth by conducting traveling educational exhibit, with high school and college-age students hosting workshops for elementary school students about important environmental issues such as: greenhouse design, plant life and natural cycles, seeds, germination, transplants, growth, harvesting, soil vs. hydroponic growing methods, recycling, solar energy, compost generation and management, bio-fuels, rainwater entrapment, sustainability and more. In addition to the planned goals for the project, BOB has also proved to have many unforeseen effects on the community. The bus has united such groups as the Montana Outdoor Science School, MSU Horticulture Club, Gallatin Valley Farm-to-School, Bozeman High School (BHS) recycling club, Hawk Tawk and TV, Irving School and even the BHS metal shop class. From an unlikely concept, Bozeman’s youth have once again proven that nothing is impossible for those who dream big. The dream, a greenhouse bus that can travel around and educate the entire community, will travel in the spring to local schools to plant tomatoes, basil, cilantro, peppers and other key pizza ingredients, and in the fall these ingredients will be harvested so local schools can have a fresh take on the traditional pizza party. As BOB tours the local scene this summer, older and younger generations of kids will bond over locally grown, fresh food. Posted in Gallatin, Healthy Eating, Programs.